Editor’s Note: Su Su Soon was originally reviewed on Okinawa Hai on October, 2 2008. It was closed for a short time, but has since be re-opened and it is re-reveiwed today for you by Kacey A. Original post is still available if you scroll down. I just want to clear up a rumor publicly for you: Su Su Soon is OPEN for business and has been actively and successfully satisfying my taste buds for a while now. It’s a very small place, with about 5 tables in the main room and a separate room with tatami seating (great place to sit with a small group or with kids); it feels cozy, not cramped. The staff is friendly and cooks up an amazing variety of food. During the week, they offer a buffet that comes with both a soup and a noodle dish cooked to order. The menu includes 20+ affordably priced sushi rolls, rice bowls, pork and steak dishes; and 5+ pancake dishes. They offer a few alcoholic beverages, teas, coffees, juices and homemade ginger ale. I personally recommend any of their sushi rolls, the eel & avocado don (rice bowl), or the buffet. You’ll be happy with whatever you order. Parking: On site, behind building. Limited. This little gem is located off 58 near Gate 1 Kadena. I think it’s relatively new as I have only seen the sign for a month or two. I recently went to lunch there with some friends so we were able to sample several menu items. 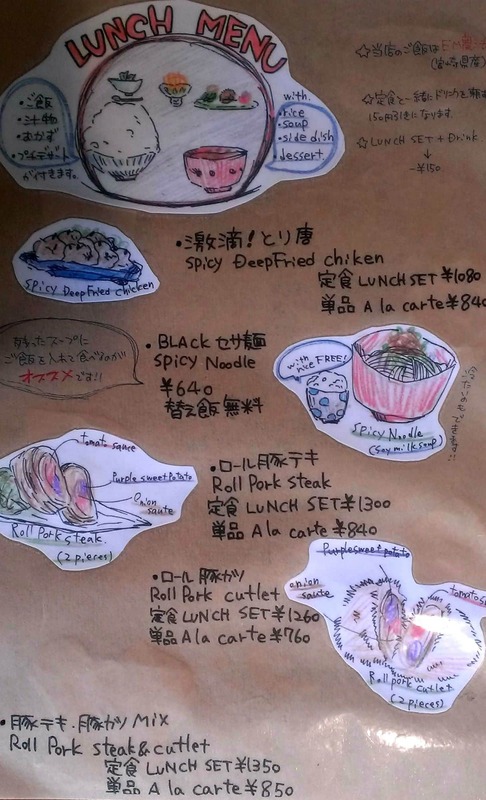 You read properly – one side of the menu has pancake meals, the other – sushi meals. I can’t think of a better combo! Upon entering the small restaurant, you’re greeted (Irashaimasse!) and asked to leave your shoes behind and don some comfy leather slippers. We headed to a large table in a somewhat separate room where we could sit on the floor pillows, but there are about six regular tables inside the main room. There is a bookshelf with several magazines and books, even a couple of children’s books – and a couple of English books & magazines too. There are also a few toys in the larger room, and my daughter was particular to a stuffed cat and a small box that contained buildings, trees and such to make your own village. She was completely entertained until we received our food! Ice water with lemongrass is offered, and as you can see from the menu, you may order beer, wine, sake, hot or iced coffee (it’s GOOD coffee), tea, mango shake (also excellent, very thick and not too sweet), home made ginger ale, which I’m sure is refreshing, banana milk and other juices. There’s also a “passion frappe” available which I might try sometime soon – it looks delicious! At our table a couple of girls had that day’s special, a tuna & avocado bowl set, one woman had the maple gorgonzola pancakes (which was topped with apple as well) and made very short work of them – and said it was incredibly delicious, my daughter had the banana caramel cream pancakes (yum!) and I had the bara-chirashi which was also on the lunch special menu. The service was great, everyone enjoyed the homey and peaceful atmosphere (Jack Johnson was playing in the background) and I was so impressed that I took my family there on Sunday for breakfast! So now we’ve also had the “home made bacon and egg” which comes also with a salad and it’s scrumptious! Su Su Soon is definitely kid friendly (though I apologize, I didn’t look for high chairs…) and I plan to visit again for dinner as THAT menu also looks delicious (see the photo). It’s about on par with the local prices for what you get. Lunch sets are a better deal than breakfasts, in my opinion. The front counter has some trinkets and even some produce for sale if you’d like to buy something. The couple who works there is very nice, and the kitchen is right there in the main room just separated by the counter. Directions: From 58 northbound make a LEFT at the light where the Family Mart/Pizza Inn/GI Bill Pay shopping center is (just before Gate 1). At the first light, make a LEFT, it’s on your right side immediately behind a banana yellow apartment building. The driveway to the parking lot is immediately on the right after you turn – it’s small though, only holds about 4-5 cars max. When I met friends they walked from the Pizza Inn lot. this place is still open… the soy milk/tofu noodle bowl was amazing! I just went by there today (nov 25, 2012) and there were 2 signs, one said “closed” and the other said “closing” and the rest was in kanji and I couldn’t read. Not sure but I suspect it has closed down for good, I would call before heading there to be sure. They are now closed on Mondays and Tuesdays and do not open until 11am (even on weekends). They are closed on Tuesdays now, but I’ll have to double check the hours on other days. Sarah – are you still having problems? We’ve been a few times since you posted, with no problems. They were closed for a few days in June or July, I’m guessing vacation or something, but have been open every time we’ve wandered over. My friends and I have tried to go to this place twice now and they are never open anymore. I drop my baby off at the daycare across the street so I look for their sign -and they will be open at 9am… we all come back at 11:30am and the closed sign is out even though the hours hang right next to it and it reads 11-4 daily! Not sure what’s going on here. We will try again next week! Went this past Sunday. Awesome place with AWESOME food! We will definitely be going back soon! Great food. Great customer sevice. They even guided us out and looked out for traffic for us when we were driving out the driveway! went this past Saturday…doesn’t open til 11am. I JUST tried their gorgonzola and maple pancakes and they were amazing! They were sweet and savory and I can’t stop thinking about them! I’m telling all of my friends about this place. This has become my husband’s favorite new restaurant! Every roll we have tried has been phenomenal (and we have tried most). I have to give a big thumbs up to the homemade ginger ale! It is very ginger-y, but wonderful! The number in the post is wrong :-/ their number is: 098.936.6237. Enjoy! Mmm, those pankcakes looked really good, but I’m a sushi girl!! I will definately be going here this weekend. Thanks for sharing! I stopped here for lunch today, it was nice to find a place with sushi rolls for lunch. I had the combo roll set and it was the perfect size for lunch – 4 pieces of 3 different rolls, veggies, soup and fruit and yogurt for dessert. Very yummy and a beautiful presentation. As I left I mentioned to her that I found her on an American website and she was very surprised, but I also just saw a write up in the Stripes supplement, so I’m sure business will pick up for them! Their dinner menu sounds good too. Ohhh that tuna avacado bowl looks so yummy. I may need to get some this weekend! Hey! I passed that place so many times last year…Its been around, but the sign is pretty new. WILL DEFINITELY stop in. Thanks Aviva! Kelley, Korea!?! You are one well traveled lady! 🙂 Have a safe trip! Hmmm, looks like I should go there this weekend! This place rocks. Particularly its mango shake. Unfortunately, my computer is doing crazy things on me for some reason, and won’t let me post all of Aviva’s other pictures of mouthwateringly beautiful food. Will remedy that ASAP! (But going to Korea tomorrow so be patient.) Good stuff though…I also like the BLT roll.